The sheriff and four of his top staffers resigned Friday afternoon over the matter. The audio of Sheriff Michael Saudino, who is white, was posted online by radio station WNYC. In the recordings, Saudino could be heard complaining that New Jersey Gov. Phil Murphy had mentioned criminal justice reform as part of his inauguration speech. According to WNYC, the conversation took place on Jan. 16 — the same day Murphy was sworn in. The station said it received a copy of the recording on Wednesday, September 19, from someone who was in the room when Saudino made the comments. The station posted three snippets of the audio online. 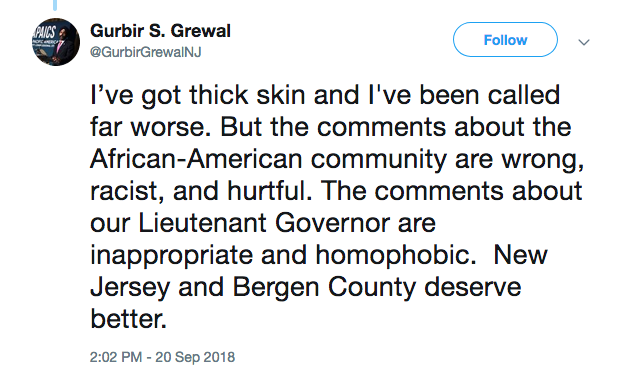 In one portion, the sheriff could be heard complaining that the governor had appointed one of Saudino’s fellow Bergen County officials, Gurbir Grewal, as state attorney general. “He didn't do that because of Bergen County,” Saudino said. “He did that because of the turban." Grewal is Sikh and wears a turban as part of his religion. Saudino also could be heard speculating whether Sheila Oliver, the state’s first black lieutenant governor, was gay. Following the release of the audio, Murphy condemned the sheriff’s comments and said Saudino needed to resign if the recordings are authentic. Grewal posted a similar statement on Twitter. By late in the day on Thursday, the sheriff put out a lengthy statement saying he had reached out to multiple people to apologize, according to the news site NJ.com. He did not dispute the authenticity of the recordings. On Friday afternoon, the sheriff's office announced that Saudino and four undersheriffs caved to the pressure and resigned. The governor will choose Saudino's replacement, according to the sheriff's office. This post was updated following Saudino's resignation.